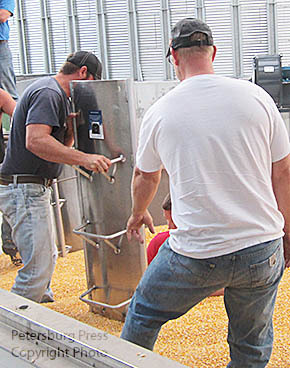 On Tuesday evening, Sept. 8, Central Valley Ag sponsored a hands-on training dealing with grain bin extraction and the use of a grain bin tub rescue. Farm Credit Services provided this equipment to Petersburg Fire & Rescue, and has provided 86 of these units to area rescue units across the United States. The set includes the panels, three ropes, three harnesses and a flashlight. The unit consists of 10 panels which are slipped together to form a circle around a victim. Panels can be put together to form a circle around the victim. Todd Heithoff of Farm Credit Services presented the equipment to the department. Details in the Sept. 16 Petersburg Press Print & E-Editions.